Skip the slice, ditch the fork and kick that big ol’ cheesecake to the curb. There’s a new dessert in town, and it’s tinier and tastier than ever. So step right up, cheesecake cookies. It’s your time to shine! Cheesecake has take on many a form around here, from cheesecake brownie bites and cheesecake chimichangas to cheesecake French toast and even cheesecake-filled chocolate turtles. 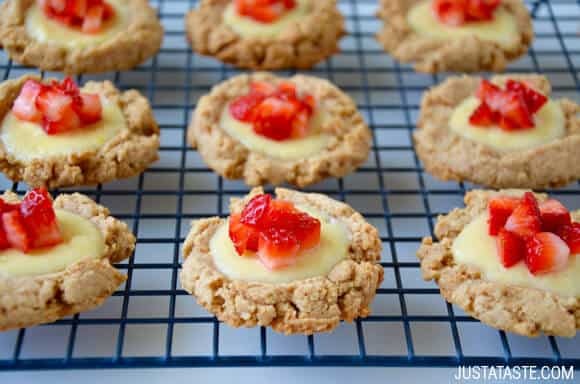 While White Chocolate Cheesecake Cookies are a crowd favorite, I knew I had to go beyond basic drop cookies with my latest cheesecake-inspired confection. 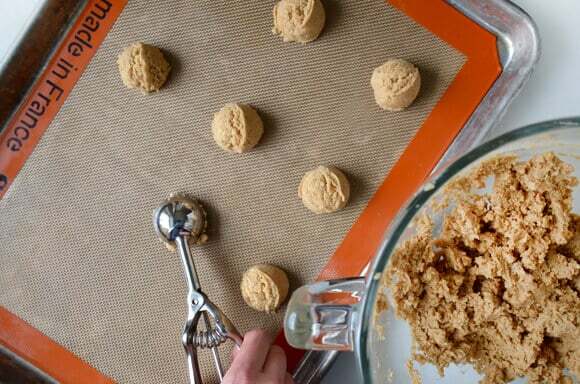 Blend the graham crackers in a food processor until they're finely crushed. (See Kelly's Notes.) In a large bowl, combine the crushed graham crackers, flour and baking powder. In the bowl of a stand mixer fitted with the paddle attachment, cream the butter with the brown sugar until light and fluffy, about 2 minutes. Add the egg whites and beat until well combined. Add the graham cracker mixture to the stand mixer and beat just until combined. 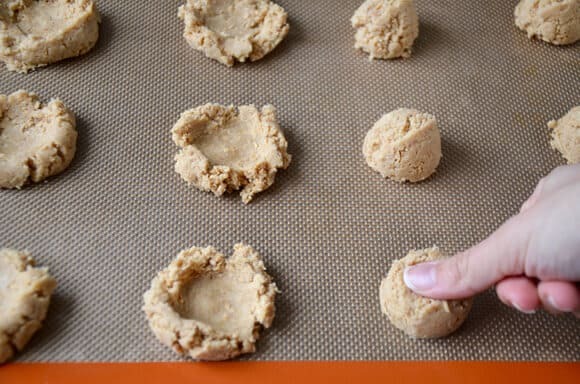 Using a small ice cream scoop, scoop about 2-tablespoon mounds onto the cookie sheet, spacing the mounds about 2 inches apart. Press your thumb into the top of each mound to form a small bowl shape. Clean out the stand mixer bowl then add the cream cheese, sugar, lemon juice, lemon zest, egg yolk and vanilla extract to the bowl and beat until well combined. 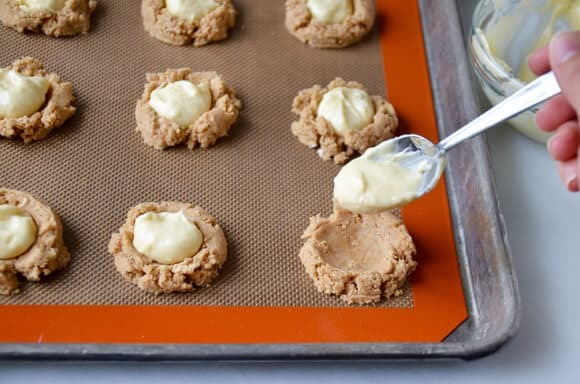 Spoon the cream cheese mixture into the centers of the cookies then bake for about 12 minutes until the cheesecake is barely set and the cookies are lightly golden. Cool the cookies for 5 minutes on the baking sheet then transfer them to a rack to cool completely. 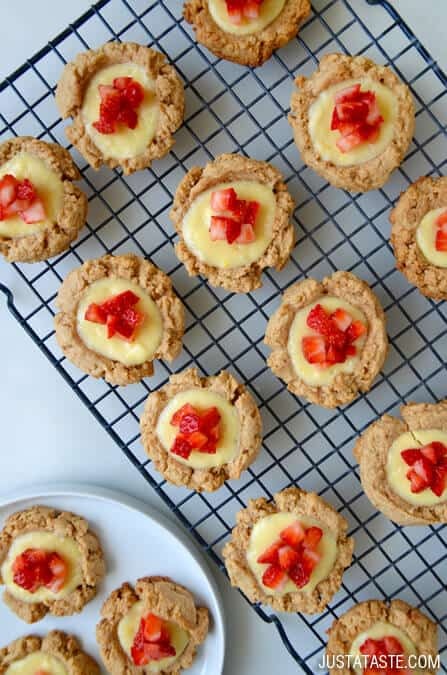 Once cooled, spoon a portion of strawberries atop each cookie and serve. It's important that the graham crackers are finely crushed (almost to the consistency of flour), otherwise the dough will be too crumbly. You can drain the diced strawberries on a paper towel to remove some of the excess liquid so it won't run onto the cheesecake filling.